"Mmm, Jaeger. Since when did you ever invest in any quality wardrobe pieces?" My companion, Elinor Gotland, was helping me sort through my felt collection. "Oh, I got that purple top in a sale, years ago. I used to wear it and then just hang it up to air. Pure wool, dry clean only. When I finally tried running it through the wool wash cycle, it felted." "You Slack Alice. What happened to the green M&S jumper? An accidental boil?" "Himself got oil stains on it, so I felted that on purpose. Before you ask, the yellow is proper felted wool, left over from an offcut I bought to make a banner." "Fair play. And with what will you require my assistance today, madam - making more bunting, is it?" "How rude. You're on your own with that, Beaut." "No, making a jerkin, a sleeveless jacket a bit longer than a waistcoat." "Oh, a gilet. Nice idea, shame the dog is more use with a sewing machine than you." "Actually, I have a cunning plan, pinched from my Mum. 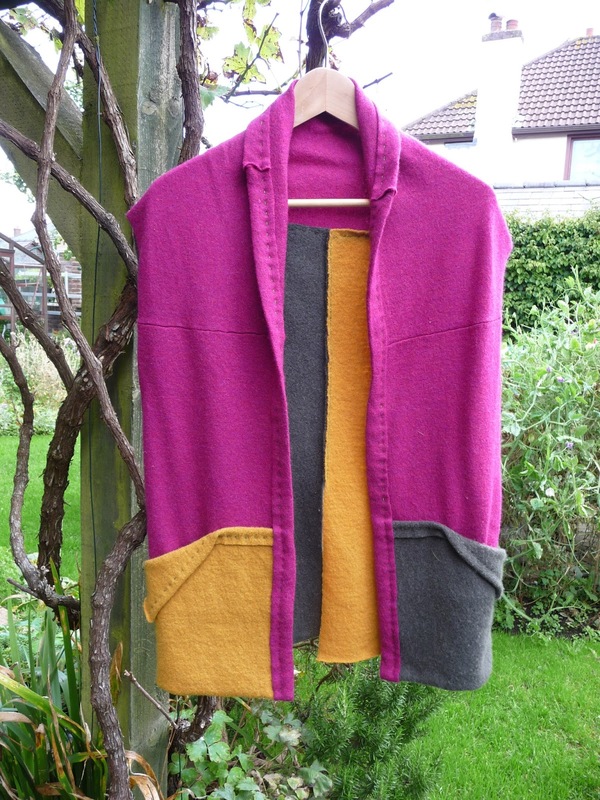 She used her weaving to make a lovely gilet, hardly any sewing involved, just using woven fabric 25cm wide. Like the selvedges of her weaving, this felt won't fray, all I need to do is cut it into strips 25cm wide." and fold the extra pieces up into pockets. Unfortunately, the weight of the doubled pockets strained the purple felt and made the front hang badly, so I needed to cut a band of reinforcement felt to sew all around the front edge. More sewing than planned, still, no regrets, I finished it in the car on the way to Spinning Camp, where it was much admired. scissors, wool, spare tent peg and so forth and the felt was warm, ideal for early autumn. My companion was too busy to come camping this time. Probably auditioning for The Great British Celebrity Sewing Bee. Next Spinning Camp will be 9 - 18 June 2017. Come and join us, details on Ravelry, Happy Campers UK forum. My first visit to Wonderwool Wales in 2013 proved to be a weekend of the highest excitement. New to spinning, it was there that I began wading through the shallows toward the depths of my ignorance. I shudder, now, to think how I used to refer to all yarn, from alpaca to acrylic, as 'wool'. Staggering towards the exit on Sunday afternoon, a trader packing up raw fleece offered me half price on her remaining Manx Loaghtan. Since these rare breed sheep are small and primitive, their fleeces only weigh a couple of kilos. A big, strong girl like me could surely manage to carry home one more bag. The deal was done, what a bargain, beautiful, unusual, gingery brown wool. Off to my first spinning camp a couple of months later, I didn't want to put anything coarse or crappy on the swop table, so I left the Welsh Mountain fleeces at home and steeled myself to offer up half my washed Manx Loaghtan. Couldn't understand why it was still there at the end of the camp. Mystifying. Put away against the day when I became a better spinner, it was a pleasant surprise to rediscover the other half of the fleece, still in a pillow case in the loft. Looking at things positively, I have definitely become a better judge of fleece than I was back then. Manx Loaghtan locks typically have a widely varied staple length. This one also had a break in the staple, about 2cm up. Matted, felted areas were probably not all due to my washing technique, as they were worst on the chest and shoulder. Oh cringe, no wonder no-one had wanted the other half from the swop table. "Take it straight to the compost heap, Beaut. That's what I'd do." My companion, Elinor Gotland, is a ewe of ruthless purpose. I hugged the full pillow case to my chest. "But I spent ages washing this fleece." "Cut your losses and spin something worth spending time on. That's real wisdom, knowing when to stop." Some lessons I have yet to take to heart. "Look at the pretty colour, though, feel how soft the fibre is." I passed Elinor one of the nicer locks. "Like cafe au lait, pale and frothy on the top." I sat down at the wheel and started drafting out a thick single, straight from the fleece. "I just want to try spinning Manx Loaghtan, it's such an ancient breed, saved from extinction on the Isle of Man. Even the ewes have those curious horns and long legs. The breeders' website says they are remarkably athletic sheep. 'Good quality stock fencing not less than 1.1m high is essential.'" Elinor snorted. "Minx could have hurdled that, no trouble at all." "A wild Loaghtan I met in Paris, danced the cancan in a cabaret, marvellous at high kicks. So talented, such a shame - she's another one who never learned when to stop." "One night, she tossed her head and went one grande battement too far - got her horns caught in the chandelier and brought the house down. Literally." It didn't take long to spin up half that small fleece and Navajo ply a lumpy yarn. Without any combing or carding, the pale tips of the locks remained intact, stippling the brindled brown. There was enough wool to knit up into a stocking stitch cushion which matches the sofa rather well. Manx Loaghtan fibre is uncommonly fine, not what you'd imagine from a so-called primitive breed. When the time comes to stop and sit down, we now have a very comfy cushion. My friend BG gave me a batik kit last Christmas. Trouble is, the instructions online say batik wax starts melting at less than 50 degrees Centigrade and the plant dyes I like using need a long simmer to fix their colours onto cloth. Recently, I read that a ferrous indigo vat works at 21 degrees and dyes cotton and linen really deep blues with short dips. It is supposed to be quick to set up and stay active for a couple of weeks, no need to keep reheating the dye pot or rushing to dip more stuff in order to exhaust every particle of indigo within one session. All in all, it sounded well worth trying to make a ferrous vat with some of the Japanese Indigo plants which are currently ready for harvest in the garden. never going to work, because by this point, I had my doubts. It was almost shocking to see that coppery film and bloom of bubbles showing deoxygenation was really happening, even though the pH was at the maximum my testing strips can indicate. Past experiments have shown that keeping the vat at pH 9 works best, but at least I wasn't planning to put any wool or silk in there. of a line. Brushing wax on using leaves for a template, you have to be quick and light handed, or the leaf gets welded on. Next, we tried out designs on a thicker curtain fabric, 80% cotton and 20% linen. The looser weave soaked up wax more readily, but by the end of the afternoon, I had despaired of ever keeping the wax temperature right without buying one of those electric heated pans. green, I stood the bucket in the sun and chucked in an unknown amount of iron in the form of an old jam jar of water with rusty nails. This did get it blooming a bit, though it only dyed things pale blue. Enough - I poured the lot down the drain, resolving to add less lime in future for a lower pH and to keep an eye out for a larger, narrower, deeper bucket. My companion, The Entertainer, Elinor Gotland, arrived home while I was putting the pieces of dyed cotton and linen into boiling water. "Hiya, Beaut." She peered dubiously into the pot. "Hope that's not our dinner. Poor Cow, you've lost the plot, gone Up the Junction, stuck here at home." "It's you who's had a dose of social realism, not me. While you've been off filming yet another Alfie remake in grubby old London, I have been practising the exotic Indonesian art of batik." "Starring in your own domestic drama. The Homeliness of the Wrong Resistance Dyer." "What's wrong with my batik resist?" "There's an awful lot of wax floating up. Did you scrape off the cloth first?" "Plenty of time for me to catch up with my enormous pile of fan mail before tea, then. Wax is a bugger to get rid of." I concentrated on scooping off as much of the wax as possible to make Room At The Top of the water. Fast as I wiped the ladle, cooling wax congealed back onto it. Beeswax everywhere with never A Taste Of Honey. Despite clearing masses of the stuff, the boiled cloth still felt waxy. A second pot of boiling water was needed. Then I tried rinsing all the fabric with a bit of detergent, particularly the cotton pieces seemed to retain a greasy residue, long after the cotton and linen mix looked clean. Eventually, I turned from the sink, wringing out the last cloth. "I never realised this whole batik technique would be such a performance. Thank goodness that wax has finally gone." Elinor was busy slipping signed photos into envelopes. She glanced up. "Gone, is it? What wax is not still lining those pots is probably settling about half way round your U bend." Oh, Look Back in Anger, what a grim kitchen sink drama. If anyone out there has some slightly more helpful advice than Elinor's, I'd be glad to hear it. Unless I can formulate a better plan, I'm not sure I'd try a ferrous indigo vat or the batik technique again. At least, not til time has mellowed the memory of this attempt. Before I started spinning, I often used to buy superbulky yarn. I like big, squashy knitwear and I also like quick results. While it is much cheaper to spin your own, the yarn I made recently was not just more uneven, but much denser than most millspun fat yarn. While 100% wool is generally less squashy than blends and synthetic fibres, my handspun also tends to have more grist. The maths is in this interesting post on the subject, all I really understand is that differences in grist can be assessed by measuring the weight per metre of yarn, when the yarns you are comparing have the same thickness, or wraps per inch. Higher grist means heavier, more wool fibres per metre, grist is increased by a worsted spinning style and a greater amount of twist. Some day, I may become able to calculate the amount of wool fibre I will need to spin the actual number of metres a project requires, but this was not that day. As so often happens, I came at this project in reverse, with 105m superbulky yarn handspun from half a small fleece. It looked like lots of wool to me. Three strands spiralled together were 9mm wide, so using great big 9mm needles, there would surely be enough to knit a cushion cover. To make best effect of the naturally varied greys and the indigo dyed end of the skein, I consulted the chapter on multicoloured yarn in my favourite guru, Margaret Radcliffe's Guide to Color Knitting. Linen stitch looked good in the illustration and dead simple to do. Cast on any odd number of stitches, in my case, 39. Row 1 is the right side, knit 1, and keep repeating (slip 1 with the yarn in front, knit 1) to the end of the row. Row 2 is the wrong side, knit 1 purl 1 and keep repeating (slip 1 with yarn behind, purl 1) til you knit the last stitch. Repeat these two rows til you run out of wool. Running out of wool happened while my piece was still too short to fold over into a decent sized cushion. In practice, all the slipped stitches mean you knit two rows to gain the height you would usually gain from knitting one row and the linen stitch fabric is appreciably thicker than stocking stitch. The pattern looked nice, anyway. I decided to carry on regardless and make it into a bag. Having started with a provisional cast on, I assumed grafting the last row to the first would be straightforward, if I just unravelled one stitch at a time from the cast on. I won't try that again - nightmare bodge job in linen stitch, I'd have had a better finish from joining an ordinary cast on and cast off row. Lucky the thick knit hides a multitude of errors. With the top of the tube of knitting folded back and the bottom sewn up, the proportions were ok for a bag. Sewn folded over into strips, the outside leg seams from my son's old black jeans made two padded handles, just threaded between the dense stitches, repurposing a jeans back pocket was an easy way of making an inside bag pocket and a small denim bird got sewn on to remind the bag carrier to keep the side without the dodgy graft facing outward. Embellishing a bag, it can be difficult to know when to stop. A rational woman can go insane with a pot of beads in front of her, but hey, less is more. I name this bag 'Blackbird Singing the Blues'. It was a present for someone who coped admirably with hard stuff. fleece was only small and amazingly soft for a Blue Texel. It surprised me to hear that the ewe it came from was already several years old, but I could have guessed Gethin had shorn that sheep, because there were hardly any second cuts. The staple length was fairly uniform at about 8cm, typical disorganised fine crimp giving the locks plenty of stretch and bounce. Beautifully open blanket, no cotting, minimal dirt, lovely varied greys with only limited fawn or brown areas (and a blue farmer's mark), it was my idea of perfection. Although this fleece took no rosette from the real judge, I spent a happy half hour explaining to the farmer why I thought it was such a cracker for hand spinning and worth far more than you'd get from the Wool Marketing Board, which pays even less than normal rates for coloured fleece. We agreed breeding sheep for their wool has been much neglected. Then I bought it. This is where my Rhapsody in Blue Texel changes key and plays those flat, blue notes. After a brief spell of gloating over its quality, fully confirmed when laid out on the lawn, I piled half the fleece into two pillow cases and put them in the machine on a wool wash cycle. Last time I did this with a Blue Texel fleece, it came out fine. Instead of experience paying off with a handy short cut toward sitting down to spin this gem, I spent all afternoon trying to wrench out matted bundles of damp locks, before giving up and stumping off to cook the tea and grieve over my own cavalier stupidity. I didn't kick myself black and blue. I have a companion called Elinor, who does that for me. "Every fleece is different, Beaut. Haven't I told you a hundred times, proper preparation prevents piss poor performance? Look at these locks, ruined by impatience and laziness." "I thought this Blue Texel would at least have broadly the same character as that big fleece I had before." "One Blue Texel is no more the same as all Blue Texels than one coffee cake is the same as all coffee cakes." "It is if you buy cake in the supermarket." "So go and buy yarn from the shops." Ooo, sting, no answer for that. Peeling potatoes in the censorious silence, I cast about for a new conversational gambit. "Heaven knows why the geneticists called the breed 'Blue Texel'. The website says that 'Blue' is the name for the colour pattern and also describes the colour of the flank wool - have you ever seen any real blue on a Blue Texel?" Elinor sat back and smiled a wicked smile. "When I was guest starring with a repertory theatre company in Holland, I remember finding blue on Tycho Texel's flanks." "Big Dutch Texel, real Moody Blue artist, used to slap paint onto canvas and just slide about on it. His fleece was always caked in acrylics, his flanks were a rainbow and he never bothered going to the shearer for a trim." She stopped pulling at the matted fleece and I hastened over to stuff it away out of sight. "That ram was a restless rogue. Lived in Amsterdam for years, but wouldn't go to the Van Gogh Museum because the queues were too long. His brother Bram was a different type altogether, a True Blue, he would wait outside the stage door of De Balie til the small hours of the morning, just to walk me home. Absolute sweetheart." "How romantic. How come your play finished so late?" "Oh, Tycho used to pop into my dressing room for a little drink after the show." Her smile did not suggest he went there to be scolded for impatience. open fibre to spin, just drafted out so easily straight from the blanket into a thick single. Working with a fair amount of twist on the 15:1 ratio on the jumbo flyer of my Ashford Traveller, I had filled a whole bobbin in less time than it took them to celebrate a couple more Gold Medals. I am now the proud owner of a nearly new Country Spinner Mark 2, infinitely easier to treadle than an Indian Spinner, though I haven't really sussed out the gears yet. Navajo plying directly from each full jumbo bobbin on the Traveller straight into the great orifice of the Country Spinner, in a couple of evenings, I had the all the remaining unwashed fleece spun into a high grist superbulky yarn, wound on the one massive Country bobbin. At which point, Elinor noticed what I had been up to. Yes, I am terminally impatient and yes, I did really enjoy it and no, I have no idea what I'll do with this yarn. After giving it a cold soak overnight in a bucket and a hot detergent wash and three rinses, I succumbed to another impulse and hung one end of it in a Japanese Indigo Leaf Dye Vat. Behold, my Blue Blue Texel yarn, 105 metres long and 5 wraps per inch.